^ a b Dobzhansky, T.G. (1937). Genetics and the Evolutionary Process. Columbia University Press. ISBN 0-231-08306-8. ^ Haldane, J.B.S. (1924). A Mathematical Theory of Natural and Artificial Selection. ^ Grant BS. (2004). 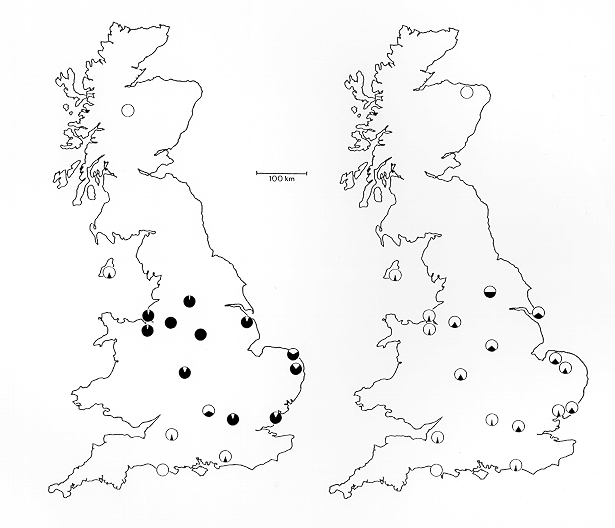 “Allelic melanism in American and British peppered moths..journal = J. Hered”. Journal of Heredity 95 (2): 97–102. doi:10.1093/jhered/esh022. PMID 15073224. ^ Steward, R.C. (1977). "Industrial and non-industrial melanism in the peppered moth Biston betularia (L.)", Ecological Entomology 2 (pp. 231–243). ^ Cook LM. (2003). “The rise and fall of the Carbonaria form of the peppered moth.journal = Q Rev Biol. = 78”. The Quarterly Review of Biology 78 (4): 399–417. doi:10.1086/378925. PMID 14737825. ^ a b Young, M. (2003). Moonshine: Why the Peppered Moth Remains an Icon of Evolution. ^ Rudge, D.W. (2005). "Did Kettlewell Commit Fraud? Re-examining the Evidence. ", Public Understanding of Science 14 (3) (pp. 249–268). ^ a b Sargent, T.D., Millar, C.D., and Lambert, D.M. (1998). "The 'classical' explanation of industrial melanism: Assessing the evidence. ", Hecht and Wallace (Eds. ), Evolutionary Biology volume 23, chapter 9. ^ Fisher, R.A. (1933). "On the Evidence Against the Chemical Induction of Melanism in Lepidoptera. ", Proceedings of the Royal Society of London, B 112 (pp. 407–416). ^ The Straight Dope: Do creationists accept microevolution but not macroevolution? ^ Coyne, Jerry A. (1998-11-05). “Not Black and White. Review of Melanism: Evolution in Action by Michael E.N. Majerus” (PDF). Nature 396: 35–36. doi:10.1038/23856. http://pondside.uchicago.edu/ceb/Majerus_review.pdf 2006年6月30日閲覧。. ^ Majerus, M.E.N. (1998) Melanism: Evolution in Action. Oxford University Press, New York.